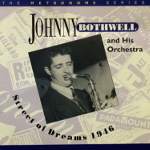 Johnny Bothwell CDs @ Hep Records, jazz in depth from the 1930's to the present day. 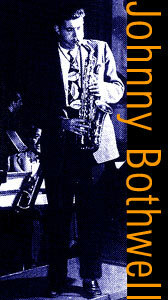 Johnny Bothwell first attracted attention as a soloist in the Paul Jordan rehearsal band in Chicago in 1941. Over the next two years Bothwell played with Woody Herman, Sonny Dunham, and Tommy Dorsey, then in early 1944 he joined the reorganised Boyd Raeburn Orchestra. Raeburn was a Chicago-based bandleader who had suddenly decided to have a top-flight jazz bigband and Bothwell became its main solo voice especially on features like "Street Of Dreams" and "I'll Remember April". Stylistically he admired Hodges and was in fact dubbed the white Johnny Hodges. With Raeburn he got considerable exposure and repaid the leader by remaining loyal in spite of many better paying offers. However by summer 1945, when the band was playing at the Palace Hotel in San Francisco, a clash of temperaments caused Bothwell and wife Claire Hogan to return to New York. There he briefly joined the Gene Krupa Orchestra and contributed the wailing alto solo on the hit record "Boogie Blues". He jobbed around in Chicago and New York with many of the leading young players of the day and formed a combo with Benny Harris and Allen Eager. The combo folded and in spite of the dismal business indicators went ahead in the spring of 1946 to form his own bigband. He put together a library from top writers like George Williams, Eddie Finckel, and Paul Villepigue and with his wife Claire Hogan managed for a while but by the following year had to accept the inevitable and disbanded. For the next two years he formed combos and bands for special hotel bookings and in 1948 his small band contained tenor sax tyro Don Lanphere. Then by 1950 he disappeared from the scene. Like his former boss Boyd Raeburn he seemed to want jazz acceptance rather than commercial success and paid the price. The records he made between 1945 and 1947 are nevertheless very interesting examples of adventurous bigband arranging and fine alto saxophone playing. Complete Studio Performances of this short-lived, but interesting orchestra 1945/47. Titles - I'll Remember April / Street Of Dreams / Laura / Lonely Serenade / Ill Wind / John's Other Wife / The Trouble With Me Is You / I Cover The Waterfront / Dear Max / Chelsea Bridge / 22 Steps From Heaven / Strange Feeling / From The Land Of Sky Blue Water / My Old Flame / I Left My Heart In Mississippi / To A Wild Rose / Somewhere In The Night / Chiquita Banana / Ain't Nowhere / I'll Close My Eyes / I Won't Promise / Get A Pin Up Girl / Dog Patch Boogie. "This 1997 CD has all of Bothwell's studio recordings as a leader (with the exception of two songs cut as a V-Disc), plus a two-selection session from 1949. The emphasis throughout is on ballads, although there are a few medium-tempo numbers that were performed for variety; subtle hints of the bebop revolution can be felt here and there ... The high points of the definitive Johnny Bothwell set include "I'll Remember April," "Dear Max," Billy Strayhorn's "Strange Feeling," George Handy's "The Trouble With Me Is You," "From the Land of Sky Blue Water" and, surprisingly, "Chiquita Banana.""